New research, published in the American Journal of Clinical Nutrition, confirms that the eating habits and food choices by individuals is controlled by their genes. Researchers from the Miriam Hospital’s Weight Control and Diabetes Center confirm that individuals with variations in obesity genes tend to eat more meals and snacks and consume more calories per day eating high fat, sugary foods. A prior study had linked obesity and over eating in children to a mutation of the fast mass and obesity associated gene FTO and BDNF (or brain-derived neurotrophic factor gene) with an increased risk for obesity. 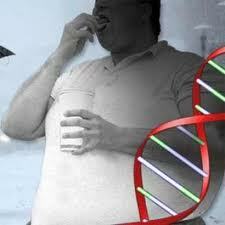 The FTO and BDNF genes are expressed in the part of the brain that controls eating and appetite, although the mechanisms by which these gene variations influence obesity is still unknown. This is the first study to correlate these same genes in adults. Variations on the FTO gene significantly increased the consumption of a greater number of meals and snacks per day, greater percentage of energy from fat and more servings of fats, oils and sweets. ← Alzheimer’s disease progression halted with Vitamin E and Vitamin C.